Once a quiet Victorian seaside resort, Boscombe has really come alive in recent years. Offering a sandy family beach it is a popular destination for both families and water sports fans alike. 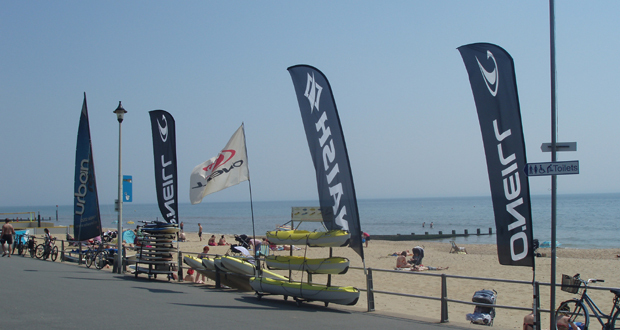 Boscombe Beach is a regular winner of various seaside awards due to its excellent facilities and cleanliness. There is also the Boscombe Chine gardens just a short stroll from the beach and a wonderful crazy golf course. In 2009 the beach area was redeveloped and the surf reef was born attracting surfers from all over the country. Sadly it was closed in 2011 as it became a potential danger to the public after it was believed to have been struck by a propeller from a boat. However, since 2014, the surf reef has been getting a new lease of life as it is now used for diving and snorkelling, as well as kite and wind surfing, as part of the Coastal Activity Park. And you can still learn to surf here at the various surf school’s based here including Bournemouth Surf School and Sorted Surf School. Or why not try your hand at beach volleyball? 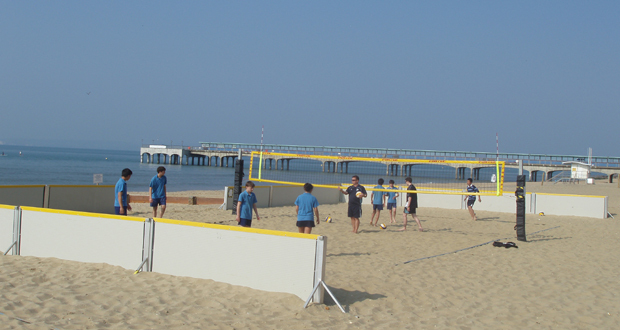 Boscombe beach has a couple of courts which can be hired! Boscombe pier was originally constructed in 1888 but partially demolished during World War 2. The pier was then neglected until it was rebuilt, opening in 1962. However it too in 2009 underwent a major redevelopment and is now a popular attraction. 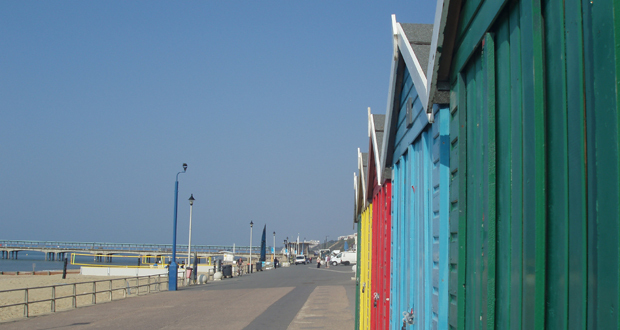 Boscombe beach has a number of beautiful Beach Huts for Hire either on a daily or weekly period. The daily and weekly charge varies depending upon the time of year and they also offer “block” periods. Full pricing details can be found on the Bournemouth Council website and bookings can be made by telephoning 01202 451781. You may also find some beach hut tenants that rent out their beach huts directly. And if beach huts seem a little too old fashioned for you then why not rent a beach pod in The Overstrand! Exclusive to this area they bring the traditional beach huts into the 21st century with mod con appliances and funky designs. These pods have been designed by Wayne Hemingway MBE and Geraldine Hemingway MBE and have each been individually designed. The pods, which are exclusive to Bournemouth, feature mains electric and a private balcony with beautiful views of the Isle of Wight and the Purbeck coast. Slightly more upmarket that the average beach hut, each pod has a toaster, kettle, microwave, sandwich maker, curtains and beach furniture. Beach pods are available to rent by the week or for whole block periods. The weekly rate, again depends on the time of the year. Lifeguard cover is provided between May and September and the beach operates the Kidzone scheme whereby you can get a free wristband for your child which is colour coded to whichever part of the beach you are based on. Barbeques are permitted after 6pm and up to 10.30pm. Disposable BBQ’s can be left beside the plastic bins along the promenade. Please ensure that you dowse hot coals first and take all rubbish with you. For BBQ’s of more that 30 people an application must first be submitted to the council. The Overstrand building also has a RNLI and lifeguard station, public showers, toilets, changing facilities and beach office. There is a car park nearby although it does fill up quite quickly but additional parking can be found to the west of the pier along the promenade and in surrounding streets. And finally the land train runs from Boscombe to Bournemouth and is a great way to save tired legs!